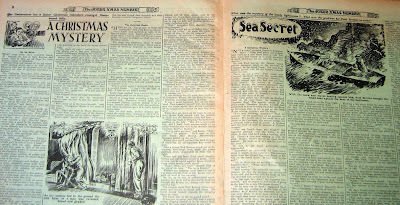 Our final destination on this festive journey into the past history of comics brings us to 1934 and this time, two vintage British comics that were published 75 years ago this week. First up, The Funny Wonder No.1,083. Don't let the "Funny Wonder and Jester" logo deceive you, - this isn't a merged title. This is the overseas edition, exactly the same as the UK Funny Wonder except for the logo. 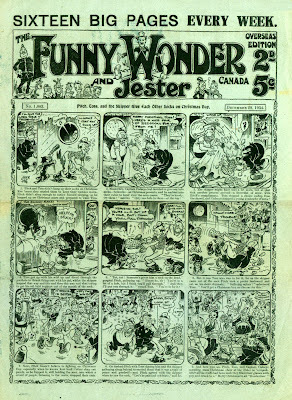 When Amalgamated Press exported their comics overseas some of them were packaged as two-in-one comics, so in this case The Funny Wonder was sold in Canada with that week's copy of The Jester inside it, hence the boast of "Sixteen Big Pages Every Week". This practice continued for overseas editions until 1940. On the cover, comical sailors Pitch and Toss and their Captain have a lively fun-packed romp with artwork by Reg Parlett "ghosting" Roy Wilson. The final panel and its inevitable slap-up feed (shown in detail at the top of this blog entry) displays a marvelous range of expressions just in one scene. Inside there's a mixture of 50% text stories and 50% comic strip, as was the standard format of comics from Amalgamated Press. 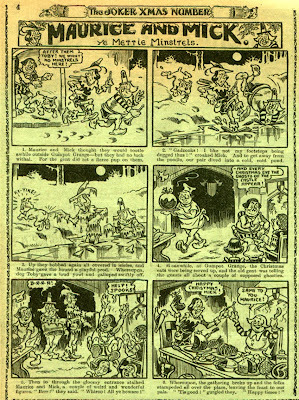 Funny Wonder and its companion comics were in their prime during this period, dominating the stands in the years before Dandy and Beano arrived. 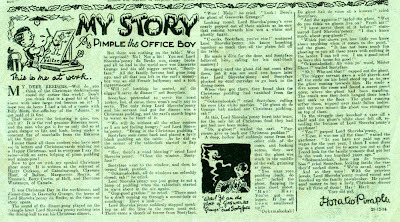 Resident fictional office boy "Pimple" tells a tale featuring a typical black stereotype of the period. Such narrow-minded depictions of black people were numerous in comics of the time, as indeed they were in films and music hall back then. No doubt some of the authors were bigots, but for the most part any offense was unintentional and naive rather than vindictive. 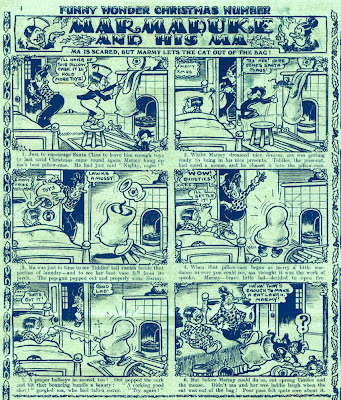 Across the middle pages of the issue, (printed in dark blue ink) a smattering of short strips, with Charlie Chaplin at the centre. The story follows a pattern repeated countless times in comics of this era: poor hero (in this case Charlie) inadvertently foils bully / robber and grateful wealthy character rewards hero with "crisp ten-pound note" which hero spends on a big meal in a posh restaurant. Artwork by Bertie Brown. The Marmaduke and His Ma strip (drawn by Wally Robertson) is interesting in that it assumes the reader knows that "Santa" is really a parent who brings in the gifts. Indeed, most kids who were old enough to read such comics would already know this, but in later decades the illusion of Santa was usually maintained in children's comics. 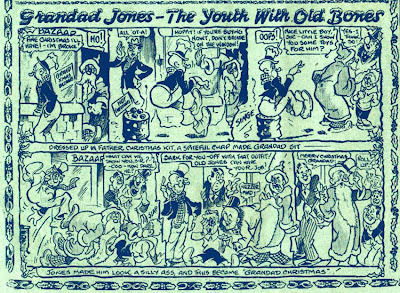 Grandad Jones - The Youth with Old Bones is the sort of "youthful grandad" character that would later resurface in The Beano's Grandpa. Speaking of which, you'll note that this strip (and many others of the period) prove that speech balloons and text-less strips were firmly in place before Dandy and Beano were launched, despite some media academics claiming otherwise. 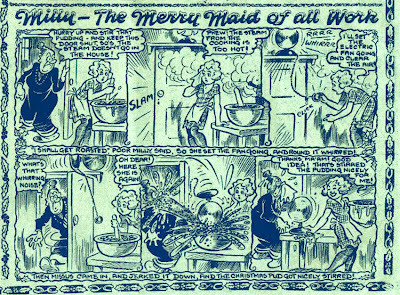 British comics always championed the poor and downtrodden and Milly - The Merry Maid of All Work gave readers a female hero to root for. Artwork by Reg Parlett. 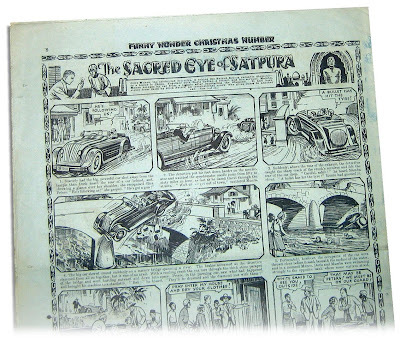 Adventure strip serials usually rounded off these eight-page tabloids and on the rear of Funny Wonder in December 1934 was The Sacred Eye of Satpura, with detective Clive Munro battling crooks in China. Artwork by George Heath, who also illustrated The Falcon for Radio Fun (see previous blog). 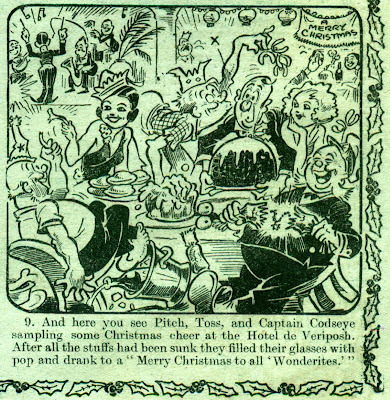 Tucked away in a corner of the comic was an ad for the Christmas issue of Larks. No bold half page announcement as titles receive today, just a postage-stamp-sized plug for a companion comic (enlarged here). 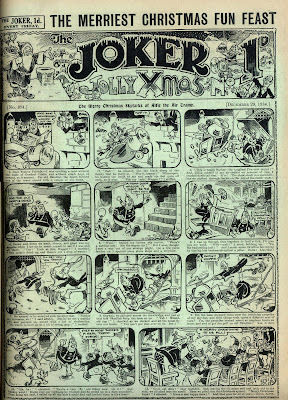 Two text stories lead off the contents of Joker, with A Christmas Mystery and Sea Secret (featuring regular hero Paul Service) both having seasonal themes. On page four, Maurice and Mick, Ye Merrie Minstrels. 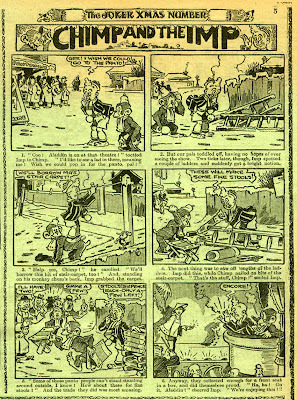 The concept of two pals, one thin, one fat, wandering the land and getting into scrapes, had been a common theme in British funnies since their 19th Century beginnings (eg: Weary Willie and Tired Tim in Chips). In its most popular pairing the concept would of course transfer to cinema with Laurel and Hardy. 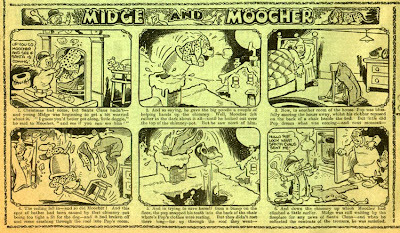 Midge and Moocher often featured scenes that simply couldn't be published in a children's comic today. This Christmas episode begins with a dog being pushed up a chimney and ends with a baby smoking a pipe. Parents today would have a fit if they saw that in a comic. Characters in these vintage comics usually ended up in better circumstances than they were in at the start of the strip, - and all within half a dozen panels or so. In Chimp and the Imp, our heroes show resourcefulness to lift them out of their situation. Clearly such tales were intended to inspire readers to be self sufficient, just as the other common theme, the reward-for-good-deed plot, was intended to encourage selflessness. 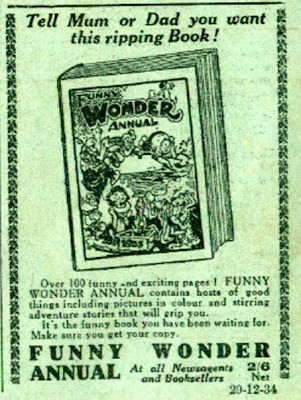 For several weeks leading up to Christmas both Funny Wonder and The Joker had been carrying small ads for the very first Funny Wonder Annual. Although children's annuals were already established none had been awarded to A.P. 's "funnies" until now... and I'll be taking a look at this rare book here on this blog in an entry scheduled for Christmas Day! If you have time, drop in! I'm fasinated by these old comics..
Just amazing see Reg Parlett's early comic work...loved seeing Pitch and Toss. Reg has had such a long comic career!! Has he drawn ffor longer in comics than any other artist? It is funny seeing the same theme over and over again..But just love the smiles in the final panel. Its important to remind people that comics have been going for a very long time..lets hope we don't ever forget these gems.. Yes Peter I think Reg must hold the record for drawing comics longer than any other artist, - unless someone out there knows differently? Lew, it's good to see you trawling through British comic history once more, the last few aticles have been really nice. Your observation about 'text-less' comic strips pre-dating the Dandy and Beano is spot on. I've found a fair few strips over the years which do not have captions underneath, the being earliest one, so far, dating from 1920. I've also noticed that it is usually only the Dandy and Beano that are said to have reduced to fortnightly frequency during the '40s, when in actual fact most of AP's comic output went fortnightly too. And not fogetting Willbank's Mickey Mouse Weekly. While I'm on the subject of comic history - the late great Denis Gifford's birthday is on Boxing Day. He was born 1927 and sadly left us far too early. This man deserves an article too! I hope you have a relaxing Christmas and a prosperous New Year. Looking forward to many more blogs. Thank you Dave, that's much appreciated. Yes, an article on Denis is long overdue. I'll definitely sort one out for 2010. Denis was an important figure in keeping the history of British comics alive and he was an excellent cartoonist as well. We owe him a great deal I think. PS: A very Merry Christmas to you too Dave! All the best for 2010. I have a funny wonder comic with heading charlie chaplin appears today ..dated 1915.. has this any value? I have a funny wonder comic dated 1915 ..headin Charlie Chaplin appears to-day.... would this have a value? I'm afraid not Stu. What you have there is a facsimile reprint that was published in the early 1970s. It was one of a collection called "Six Comics of World War One". I must do a blog on that soon as there are a number of dealers out there trying to pass off those comics as originals. Can you please tell me how much a funny wonder annual 1939 in excellent condition would be worth? I've no idea, sorry. I don't deal in values, and I've never seen one in that condition up for sale so you could name your own price and see how it goes.